First thing we prefer to do as soon as we flash a Custom ROM, is flashing Gapps package. Google will soon release Android 10 Q this year, whereas, Android 9.0 Pie released last year, which is the successor to Android 8 Oreo. The popular Custom ROM developers like Resurrection or LineageOS has already created Custom ROM based on the ASOP (Android Open Source Project) source code for the latest Android version. Hence, if you are one of those who flashed any Custom ROM based on Android 9.0 Pie, Android 8.0, then you might have surely noticed that Custom ROM does not include any Google Apps, like Gmail, Play Store or Youtube etc. The reason behind this is simple, Google is behind Android, but Android is Open Source, whereas Google Apps are not. Google apps are often included by OEMS in their customized version of Android specifically for their devices. For instance, Samsung has One UI, Xiaomi has MiUI, Oppo has ColorOS, ASUS has ZenUI, similar is the case with other OEMs. If you are looking to take advantage of Google Apps/ Gapps/ Play services in your Custom ROM, then you must flash the package manually. 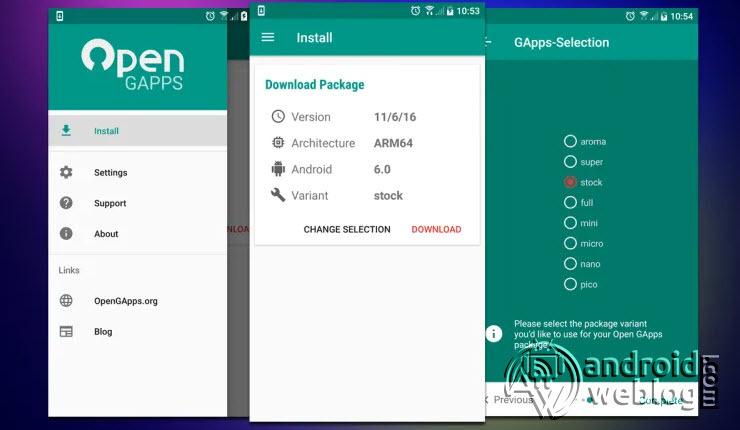 The Gapps package ‘Open Gapps’ comes with Play Store, Gmail while others. In the due course of the article, we have listed the download link of Open GApps, which is the most popular, and widely used GApps package out there. The popularity of Open GApps package has taken like a storm, since its release. Hence, if you have flashed Custom ROM, then flash Open GApps without having a second thought. The Open GApps is an open-source project, which provides the automatic generation of up-to-date Google apps packages. As apps are automated automatically by buildbot, it doesn’t require human interference, and apps gets automatically updated instantly as soon as they released. The biggest advantage of or characteristics of Open GApps is that it supports all platforms and Android versions. There are several packages available, including Google Super Package (contains all Google applications released till date), and Stock Package (includes most of the current applications and Nexus applications). There is a special ‘for Stock ROM‘ mode, which ensures to the Google Nexus or Pixel devices file system architecture. Android 9.0 Pie, Android 8.1 Oreo, Android 8.0 Oreo, Android 7.1 Nougat, Android 7.0 Nougat, Android 6.0 Marshmallow, Android 5.1 Lollipop, and Android 5.0 Lollipop. The graphics installer of the super package, which provides the option to select the apps. The Super Package, this package is all-in-one which contains all the apps ever shipped or released by Google. This is the stand package, which contains latest apps, which are available on Nexus or Pixel devices. Shares the similarity to Stock package, but doesn’t replaces the non-stock apps. Contains the most popular Google Apps, including extra functionality which is not available at Google Play Store. Contains Youtube, Gmail, Hangout, Google Play Games. etc. Includes more apps than pico package. The most downloaded Google Apps package, due to the fact that it is small in size, and consumes very less internal storage in your device. Though, it does the job, as it contains the Google Play Services including Play Store and YouTube. It doesn’t contain other Google apps which are generally used by many but not all the users. The procedure to flash latest Open GApps is fairly simple. After you have flashed the Custom ROM on your device, then simply flash Open GApps downloaded from the link provided above through the recovery. The below steps requires that your device have Custom Recovery Installed, and you have downloaded the right package for your device. Step 1: Select Install option, then browse to select the Open GApps ZIP file. Next, its time to select the option to flash GApps package. Step 2: Swipe to Confirm Flash in TWRP, then wait as the Google Apps install on your device. Step 3: Once the process completes, tap on Back, then select option to clear device cache. Select Wipe > Advanced then check Dalvik Cache and Cache, followed by Swipe to Wipe. Now, restart the device. That’s it. You have flashed GApps on your custom ROM. It is worth mentioning here that after device flashed with GApps, it takes longer than usual to boot, just like it does while flashing a ROM. Once flashing process completes, you might prompted to Sign into Google account.